A developer who rode roughshod over villagers’ rights by blatantly extending a building site over a long-used roadway, filling in part of a water source and causing flooding by blocking a culvert will face stringent action. 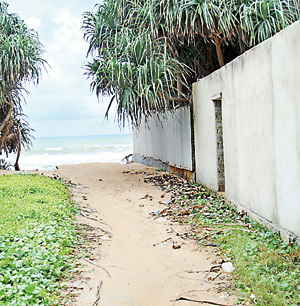 The Coast Conservation Department is to issue an order to demolish the construction of a guesthouse on Kosgoda beach, the Director-General of the department, Prabath Chandrakeerthi said. The action follows complaints made by the local villagers that the construction was illegal and causing severe difficulties in their lives. ”The construction site in Kosgoda was being constructed too close to the beach. In addition to that, the building was being constructed over a drainage line. They were also filling up an oya which is located next to the building,” Mr. Chandrakeerthi said. On Friday, the landowner appeared before the Balapitiya magistrate and was fined Rs. 5,000. The Pradeshiya Sabha had only allowed the construction on the basis that laws and regulations were followed, an official said. “However, following the recent inspections that the Pradeshiya Sabha carried out on the site, we found that the conditions had been violated,” the official said. The villagers last week staged a protest alongside the Galle Road in Kosgoda. They alleged that the construction site had been built over a roadway, the Sri Gnanawimala Mawatha. “No sooner he acquired this land, he closed the road and began to fill the land up with soil and sought the necessary permits to build on it,” Mr. Rajeewa Soysa, a local resident said. “He also started filling up the Gongal Oya with rocks and clay, slowly extending his land. “The alternative route that we got is completely insecure. During the high tide we cannot even use this pathway.“The fishermen in our village have used the roadway for years. The villagers used this road to get to the next village to visit their relatives,” Mr. Soysa said. 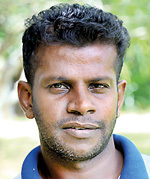 The Sri Gnanawimala Mawatha connected the two villages by a 200m stretch but the journey became one kilometre long when the villagers were forced to use the Galle Road. The construction had closed up a culvert that once used to carry rainwater from the area through a canal and into the Gongal Oya, said a resident who wished to remain anonymous. “This has caused flooding during the rainy season and as a result of the flooding the cesspits in our households are filling up,” he said.